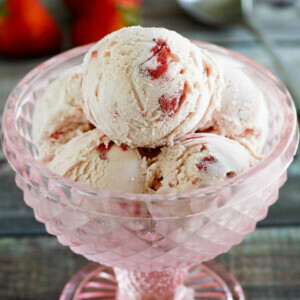 This ice cream recipe is so easy to make since you don't have to cook the base for the custard. An ice cream maker does all the work for you! Whisk the first four ingredients in a large bowl until blended. Process the strawberries, lemon juice, and salt in a blender or food processor until smooth. Stir into the milk mixture. Cover and chill until very cold (at least 4 hours, but preferably overnight). Pour into the freezer container of an ice cream maker and process according to the manufacturer's instructions. Transfer the ice cream to an airtight container, and freeze until firm.